It’s a Mad, Mad, Mad, Mad World… largely influenced by AMC's hit television series Mad Men, the suave, clean looks of late 1950s-mid 1960s era Madison Avenue advertising world have taken to the current runways, offices and streets with great vigor. Button up, fellows; it’s a time travel look that also feels very right now. It’s quite clear that the AMC television series Mad Men has the world in a state of fixation. The drama that has garnered numerous awards has more been heralded as one of the finest show in recent history. 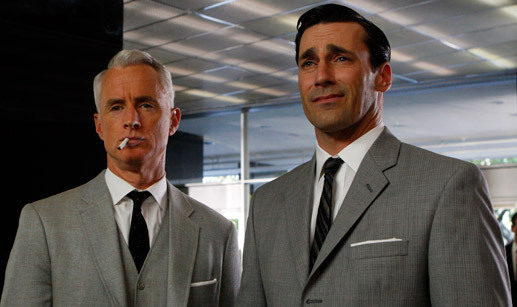 Mad Men, short for Madison Avenue Men, has become an instant classic. Set in the advertising industry at the dawn of the Kennedy-esque1960s, the show focuses on antihero Don Draper—played by the square-jawed Jon Hamm—and his colleagues at the Sterling Cooper advertising agency on Madison Avenue. “What ‘was’ in is ‘now,’” says Neiman Marcus men’s fashion director, Colby McWilliams. “Looking back on fashion, this period was what we perceive to be modern. I love the series and certainly the clothes,” he states. “Especially the trim suits and ties. It’s very chic.” John Varvatos, Etro, Michael Kors, Chanel, Thom Browne and others are just some of designers across the world who have also been reveling in the fresh take on a classic style. Gents, gone are the days of rock-n-roll themed T-shirts, juvenile baseball caps, and flip-flops. We predict it here and now. Laid-back casualness may have been acceptable for those summer days spent on the beach, but fall fashion encourages you be more grown-up. A tie bar, cuff link, and a pocket square proves to be the icing on the cake of the revised look of men, both Mad and otherwise. The series playfully harkens back to the era’s movies such as The Apartment, The Man in the Gray Flannel Suit, From the Terrace and the 007 films where any man felt empowered, due to succinct media messages about masculinity. With only the right after-shave/porkpie hat/tie bar/two button suit-you name it, our mid-century hero, too, could deflect international criminals and still be dressed in a tuxedo in time for dinner at eight with the most beautiful, chiffon-clad woman in the room. No confusion of gender roles in the world then, it was a time when a man was a man and a martini was, well, shaken and served ice cold by something in fishnet stockings. Classic stars such as Steve McQueen, Frank Sinatra, Dean Martin and those who played macho roles, always wore clothes that were integral to their Don Juan characters. And they fit like a glove. Heck, it was part of their armor, whether in the boardroom or bedroom. Critics and fans have fawned over the Mad Men social commentary, which is both nostalgic, yet still very much tackles current subjects such as sexual discrimination, adultery, racism, and other hot button issues. All of it veiled behind a dusty cloud of cigarette smoke and too many twelve o’clocktails behind closed doors at Sterling Cooper. Draper himself is a smooth-talking opportunist and sly adulterer, while his boss Roger Sterling—portrayed by John Slattery—abides to a similar lifestyle minus the suave subtly. The other cast members are Ivy league grads, transplanted Midwesterners and small town boys with dreams of making it big in a man’s world, no matter what the personal price is to be paid. There’s a nod to the writings of John Cheever and Shakespeare in the series, where these everyday heroes suffer slings and arrows of outrageous fortune. 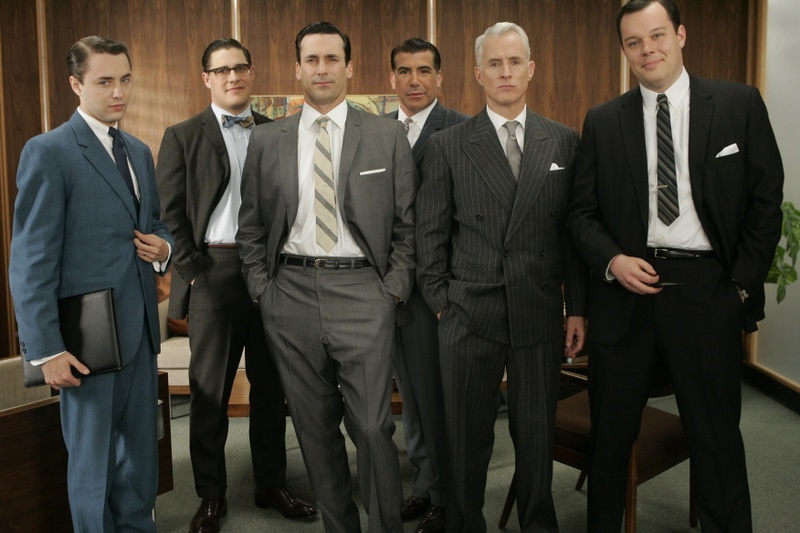 Though based in the early 1960s, the world of Mad Men feels decidedly 1950s. If one thinks in eras in terms of world events, the 1950s started with the end of World War II in 1945 and had the longest run any era ever had, ending with Kennedy’s assassination in late 1963. The post war modernist smugness and sometimes oblique impropriety seemed more grow more gentrified by being button downed and spit polished shine. All slick as a whistle on the outside and perhaps not as virtuous on the inside, once the carpet was pulled back on the brushed era, is the message that both the show and the clothes evoke. This simplicity of the fashions of Mad Men have sent most menswear designers into a creative whirl, to say the least. Slim suits, skinny ties, and the occasional fedora—those dashing silhouettes once seen in droves from Madison Avenue and Main Street, are now reappearing on runways and in the windows of finer clothing stores. And, at a time when menswear has been desperately lacking creativity, it could not have made a more welcomed and timely comeback. Keen Etro of Etro has its own “Mad” interpretation. He brings color and a bit more whimsy to the serious suiting point of view. Ralph Lauren, who could be said to have been “Mad” when mad was originally thought departed, shows that his Purple Label silhouettes are as neat and trim as the men who wear them. Ferragamo shows browns, blacks and serious shades of gray suiting that are punched up with sophisticated vests, overcoats and fedoras to evoke a modern sensibility to the looks of the Eisenhower and JFK eras. The fabrics of the suits seen in the series are those similar to those seen now on the runways and in stores, and more comfortable and wearable. If you ever wondered why your dad’s wool suit seems smaller than you remember it being on him when it’s pulled out of the truck, it’s likely because it shrunk. Rayon, Ban-Lon and other space age materials were just making their way into mainstream men’s suiting and accessories by the late 1950’s and 1950’s. Today’s microfiber blends help to retain a suit’s shape, travel ability and sheer longevity. The era’s glory and glamour can also seen in the collections of Italian Ermengildo Zegna and Roberto Cavalli, Hugo Boss and classic Calvin Klein, too – and they all have ties to filmland. Film stars have embraced the “Mad” look, too. From celluloid to read carpets George Clooney, Hugh Dancy, James Franco and Daniel Craig are machete-like sharp as they influence their contemporary style peers. The Hollywood look complements a return to more elegant women’s dressing of voluminous skirts, flattering, lady-like necklines and important jewelry. The men’s look has as many female fans, too.